I am a huge fan of the action/adventure pseudo platformer “genre”. Games such as Spyro, Jak and Daxter series, Kingdom Hearts (to an extent). One of my favorite series was Ratchet and Clank. It had been a good many years since I got my hands on one of these games. I missed the PlayStation 3 round, and stopped playing them during the PlayStation 2 era. After experiencing the PS4 one (great fun but no I will not see the movie) I got the urge to go back. After some time I finally got my hands on the original Ratchet and Clank. I remembered it as being a fun and sometimes challenging game. That the addition of guns presented different ways to face challenges and took it to it’s own realm. Now roughly a decade later did my experience change? 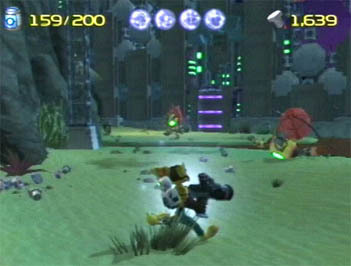 The game starts with Clank escaping his own planet after discovering something that we don’t see but is shown to horrify him. He crash lands on Ratchet’s planet and the two become reluctant heroes. Clank simply wants to find a real hero while Ratchet only leaves because the two are being chased. Throughout their adventure Clank quickly begins to realize that it’s not just their job to find someone else but to step up as heroes themselves. Ratchet remains reluctant and only focused on his own personal gains. The story itself is not that compelling rather just simply an excuse to move forward. That is not to say it’s bad, it just simply doesn’t present anything overly unique. What does exist is great humor in that plot. Instead of trying to tell a new story Insomniac seemed to put it’s effort into telling a standard hero tell in a funny way. Ultimately it works, and works well. I was not surprised by anything that came up, and sometimes was even disappointed with the pacing. However I was also laughing and entertained by the interactions. If you know you aren’t coming up with something brand new, making sure to be entertaining is another solid way to go about the story. Gameplay was mostly as i remembered, but the PlayStation 4 version did actually change a few things in my mind. I had completely forgotten that the aiming system in Ratchet and Clank is fairly broken. I don’t enjoy making such bold and dismissive statements, but time has not been kind to the aiming (or lack there of) in this game. 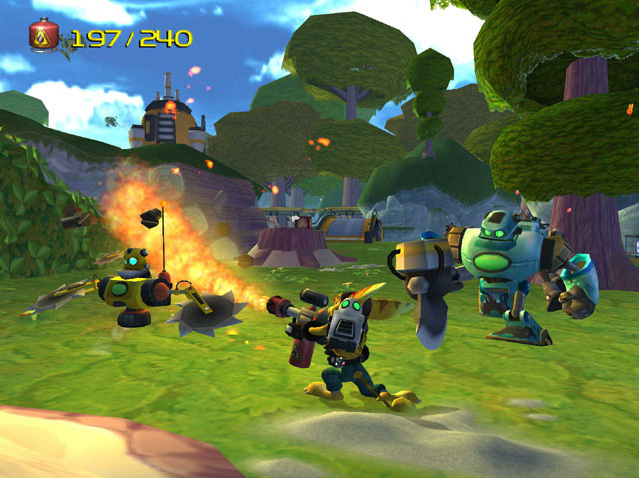 In later versions of the game lock on and strafing became an important part of gameplay, largely due to the fact that in 3rd person shooters it’s helpful. Ratchet and Clank does not really have this. If you get close enough to an enemy or aim just so an auto aim will eventually trigger, it’s very difficult to get working and equally easy to lose. As a result combat often becomes difficult, but not for the right reasons. By that I mean it’s difficult because you are fighting the game mechanics as opposed to the game itself. I am the first to admit that I am not the best gamer out there, I struggle with games that others find rather easy. That being said I don’t hate difficult games, but I do dislike when games are difficult and it’s not by design. If controls are clunky, mechanics don’t work well, or flaws exist in the game that are not meant to be there that to me is the “wrong reason” for a game to be challenging. Despite the difficulties in aiming Ratchet and Clank does have a solution, be it to an accidental problem or not. The game has a wide range of weapons, as such there are many that don’t require precise aiming and help in those situations. It’s great, but as it’s a fix to something that is not meant to be a feature I find it is still worth noting the flaw. Outside of the aiming issues the game has aged fairly well. It still feels rather smooth control wise and most of the other mechanics work well. Going back to retro games can often be frustrating because you find yourself fighting the game more than you remembered, outside of one instance this isn’t really the case with Ratchet and Clank. Aside from the above mentioned humor the game also still excels in two areas. World design and soundtrack. I had remembered enjoying the soundtrack from this game, and I actually forgot how much I did. This game has a solid soundtrack. Almost every world has it’s own song (or often songs) with each one standing out from the others. It is truly a joy to play through the game if for no other reason than to enjoy the soundtrack. To me great music helps make a much more enjoyable, and the soundtrack here is just plain fun. It’s not moving epic pieces, but enjoyable fun pieces that fit perfectly with the worlds and overall game. World design is also great. The worlds are small, make no mistake about it. You can easily finish an entire world in less than an hour. Each world is different from the ones you’ve played before that. There was great care in picking different color palettes, what environments were actually composed of, and even flow of the level. While enemies are not overly varied (you will see a lot of repeating enemies) there is something unique to each planet. Not only that but you find more biological enemies in the more organic worlds, while you might find mechanical ones in the more man-made worlds. You can argue that the worlds are simply far too small, but at the very least you won’t get bored with them. It doesn’t feel like going to a copy and pasted planet over and over, but rather unique environments with their own personality. Overall going back to Ratchet and Clank was an enjoyable experience, and I had really remembered it fairly true to life. There were moments when I was convinced that I could do something in this game, only to discover it was not a feature introduced until later in the series, but this is not unique to this series, going back to all series runs that risk. I had remembered it challenging me a little, but had forgotten that some of the challenge came from design flaws. I did remember the humor and it was still fresh in my mind. The game has aged well, it’s problems are apparent but not so overwhelming as to damage how enjoyable the game is. Not only did I enjoy it the first time, but I have already played it again since going back to it. It remains an important memory in my younger years of gaming, and still holds a special place in my heart. If you are looking for some retro games this one is worth revisiting. If you never played the series then it might just be worth giving it a try.